Dennis Welsh votes in the primary election Tuesday, Aug. 12, 2014 at Shelton Intermediate School in Shelton, Conn. Turnout is fairly low for the district with just 233 votes cast at 4:45 pm. 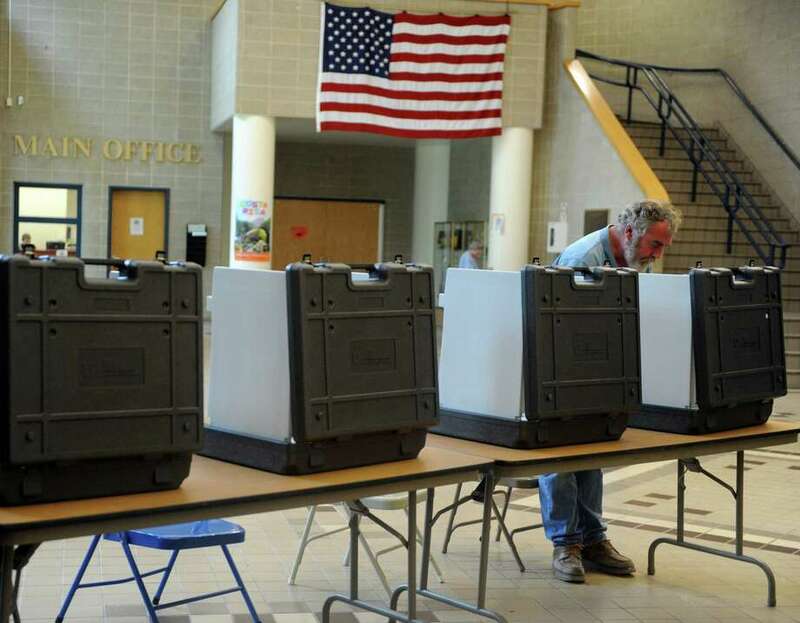 Republican primary voters in Connecticut doubled-down on Tom Foley to be their nominee for governor Tuesday, setting up a bellwether midterm election rematch with Democratic incumbent Dannel P. Malloy despite anemic turnout. Foley, 62, fended off a late charge by state Senate Minority Leader John McKinney in a two-way primary, with the Associated Press calling the race for the former diplomat and Greenwich private equity manager shortly before 9 p.m.
A mere 6,400 votes separated Foley and Malloy in the 2010 election, with the state's largest cities propelling the former Stamford mayor to a controversial victory that was marked by a ballot shortage and voting irregularities in Bridgeport. Malloy, 59, is hoping to avoid becoming the first sitting governor since John Davis Lodge, who served from 1951 to 1955, to be ousted after one term. The highly-anticipated rematch is being handicapped as a toss-up race, with Connecticut's sluggish economic recovery a drag on Malloy's approval rating. More people responding to the May poll conducted by Quinnipiac University said that Malloy did not deserve to be re-elected (48 percent) than those that did (44 percent). Foley, 62, will try to do what Linda McMahon could not -- win statewide office on his second try. Often Compared to Mitt Romney because of his management background and staid demeanor, Foley waged a general election campaign that focused on Malloy throughout the primary race. He paid little attention to rest of the GOP field, which contracted from five other competitors that included Danbury Mayor Mark Boughton to just McKinney. McKinney, 50, the highest-ranking member of the GOP minority in the Legislature and son of the late U.S. Rep. Stewart B. McKinney, narrowly qualified for the primary in the waning moments of balloting during the state party convention in May.